With the recent actions in Mali and Somalia, French foreign policy has entered a new phase. When Nicolas Sarkozy came into power, one of his assumed objectives was to bring France to the fore internationally once more. In contrast to the United Kingdom, the French tend to treat their former position of dominance on the world stage as something about which there is a certain degree of collective shame. But recent events would seem to suggest that even under a Socialist President, their foreign policy has entered a new phase of unflinchingly going into military operations abroad à l’Américaine. Perhaps it’s also the decidedly unexciting image of current president François Hollande that is playing a part in all of this gung-ho international action. It has been proven time and again that one way of enlivening your image at home is to go and take on some bad guys somewhere around the world and Hollande has suffered in the past few months from a couple of humiliations politically – particularly the rejection of the Constitutional Council of his landmark 75% tax rate (for those earning over €1 million euros per annum). Minister of Defence Jean-Yves Le Drian confirmed that the decision to go ahead with the weekend’s abortive raid in Somalia was taken a month ago “as soon as we knew with a maximum of certainty precisely where the hostage was.” A commando squad from the DGSE (Direction Générale de la Sécurité Extérieure) was involved in an action on Saturday to try to liberate Denis Allex. Allex has been held by Islamic extremist militia since 2009. It appears that two French soldiers were killed in the operation but their identities are not yet clear. As for the hostage himself, it is still not certain whether he survived the assault. The Islamists are claiming that he is still alive, whilst the Ministry of Defence say that all indications are that he is dead. “All indications are that Denis Allex has been killed.” French Defence Minister Jean-Yves Le Drian. “People saw (the French commandos) getting out of the helicopters in the fields, the chabbas were informed that helicopters had landed and that soldiers had emerged from them, and so the (islamists) were prepared.” A local Islamist commander confirmed that he was warned of the arrival of the French soldiers without saying how. 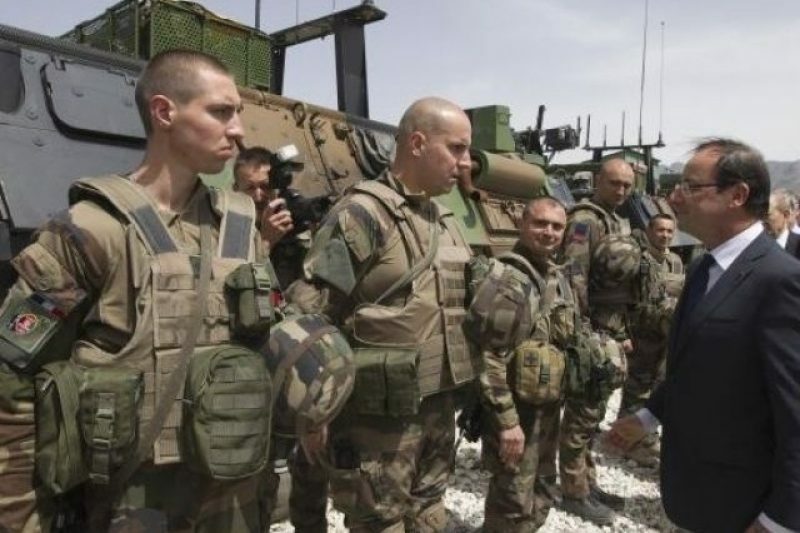 For his part, Jean-Yves Le Drian admitted that on Saturday that the resistance to the French operation was “greater than expected”, despite having brought in approximately 50 men in at least five helicopters. Somalian civilians appear to have suffered a greater loss than the French, with at least eight of them reported to have been killed during the violence, according to citizens of Bulomarer; where the secret service agent was said to have been held hostage. Four of those civilians were apparently killed on the ground as the commando force was making its way towards the hostage detention site. Four others then died during the shoot-out which ensued between the commando force and the Islamist insurgents, according to reports by witnesses who were interviewed over the telephone by journalists based in Mogadishu working for Le Monde. Into the Heart of Darkness: French troops boarding a transport plane in Ndjamena, Chad on Saturday. In Mali, meanwhile, French Air Force planes struck at Islamist rebel bases in the north of the country. They were requested to do so by an embattled government of the former French colony. Another of France’s former colonial possessions – Algeria – allowed passage through their air space so that the attacks could be carried out. French Foreign Affairs Minister Laurent Fabius publicly acknowledged support from the Algerian government on television show “Grand Jury LCI-Le Figaro-RTL”. Algeria, said Fabius, “granted use of their air space and I thank her for it… France had to intervene with great urgency. If not, there would not be a Mali any more, but a terrorist state in its place…. When the terrorists decided to mobilise, it became a question of life or death for Mali,” the head of French foreign ministry added. The Minister also thanked the “absolute and considerable support” that the French armed forces operation obtained in the context of United Nations resolutions. “None of the states put up the slightest protest,” said Fabius, who made mention of the “practical support” of Great Britain and Denmark and other large countries like the United States, who weighed in with their support in terms of transport and communication. The decision from Algiers to offer such support is significant (see previous article), particularly given the traditionally wary or downright hostile stance normally taken by the Algerian authorities in the face of any sort of military intervention from Paris in the region. Once the African expedition force has gained the upper hand in the North of Mali, “The Algerians need to close their frontiers” in order to cut the Islamist rebels adrift from their bases, added the Minister. Malian Franchise: A pick-up packed with Islamist extremists linked to Al-Qaeda. While underlining that President Hollande didn’t hesitate to give the order to attack, there is also the difficult issue of the eight French hostages being held in the north of Mali. The fate of those hostages is cause for concern amongst those in the French government, but, Minister Fabius underlined, “one does not protect hostages by giving in to the terrorists.” He added that the Head of State was due to meet the families in the coming days. Meanwhile, the air strikes continue for the fourth consecutive day in Northern Mali, concentrating on mobile “pick-up columns”, according to the Ministry of Defence, who estimate that fighting will continue for “a matter of weeks” before order is restored on behalf of the Malian government. The Franco-Malian counter-attack force left from Sévaré, which is located 70km north of Konna in the centre of Mali where troops landed on Thursday deployed from French special forces already stationed in Africa. Fighting with heavy arms ensued between Malian forces and Islamist extremists allied to Al-Qaeda who were heading south towards the capital Bamako. Approximately twelve Malian soldiers were killed, as well as one French soldier who died of wounds received from a light arms gunshot.